The ameboid protozoan Dictyostelium discoideum is a powerful system for genetic and functional analysis of gene function. The 34 Mb genome contains many genes that are homologous to those in higher eukaryotes and are missing in Saccharomyces cerevisiae. 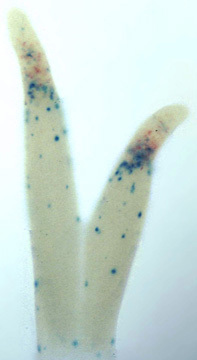 The organism is uniquely suited for studing cytokinesis, cell motility, phagocytosis, chemotaxis, signal transduction, and cell differentiation during development. Many of these processes, which play important roles in health and disease, are either absent or are less accessible in other model organisms. Dictyostelium amoebae grow as separate, independent cells but interact to form multicellular structures when challenged by adverse conditions such as starvation. Up to 100,000 cells signal each other by releasing the chemoattractant cAMP and aggregate together by chemotaxis to form a mound that is surrounded by an extracellular matrix. This mechanism for generating a multicellular organism differs radically from the early steps of metazoan embryogenesis. However, subsequent processes depend on cell-cell communication in both Dictyostelium and metazoans. Many of the underlying molecular and cellular processes appear to have arisen in primitive precursor cells and to have remained fundamentally unchanged throughout evolution. Basic processes of development such as differential cell sorting, pattern formation, stimulus-induced gene expression, and cell-type regulation are common to Dictyostelium and metazoans. Download a figure showing the vegetative, developmental, and sexual life cycles of D. discoideum. D. discoideum is one of the model organisms chosen by the National Institutes of Health as part of its Model Organism Initiative. dictyBase's Colleague database contains over 1100 researchers and our weekly newsletter goes to nearly 600 researchers around the world. This active community has had an annual scientific meeting every year since 1983, typically attended by over 150 investigators. Around 200 publications involving Dictyostelium appear each year in peer reviewed journals and as of 2010 the NIH RePORTER Database lists 87 funded research grants using Dictyostelium. Many phases of health and disease depend on the behaviors of individual cells so beautifully displayed in D. discoideum. For example, cytokinesis is critical in cell proliferation and is therefore an integral part of immune response, tissue maintenance, and cancer. Cell motility is an essential early event in metastasis of tumor cells and in angiogenesis by endothelial cells. Chemotaxis and signal transduction by chemoattractant receptors play a key role in inflammation, arthritis, asthma, lymphocyte trafficking, and also in axon guidance. Phagocytosis is a critical process involved in immune surveillance and antigen presentation. Cell-type determination, cell sorting, and pattern formation are basic features of embryogenesis and alteration of these events can lead to neoplasms. Recent studies have taken advantage of the organism's genetics to study myosin mutations that cause cardiac myopathies, resistance to the anti-metabolite cis-platin, and the mechanism of action of lithium. In addition, infectious diseases such as amoebic dysentery, amoebic keratitis, granulomatous amoebic encephalitis (GAE), and primary amoebic meningoencephalitis are caused directly by amoebae. 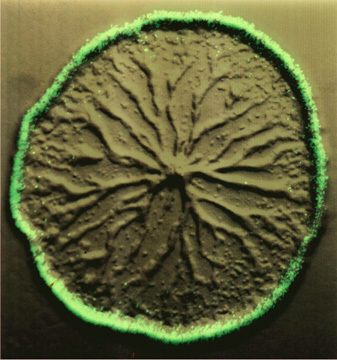 Dictyostelium is popular in educational settings because of its interesting and visually striking life cycle, which can be readily observed with simple equipment. Because of the ability to grow Dictyostelium at room temperature, using relatively inexpensive media, a large number of laboratory exercises have been developed using Dictyostelium, several of which are available on dictyBase's Teaching Tools Using Dictyostelium discoideum page. Dictyostelium is a powerful model system to study important biomedical problems. Numerous molecular genetics techniques, including gene knock-out, gene knock-in, restriction enzyme-mediated mutagenesis, RNAi, and inducible gene expression, allow a wide range of biological questions to be tested. The dictybase Techniques pages contain protocols for many widey used methods. The simplicity of the life cycle facilitates mutant selection. The growth and developmental stages are completely independent, and switching between the two states is achieved by removing nutrients. Many mutations can be screened by clonally plating cells on bacterial lawns. As the amoebae grow, they ingest the bacteria and form a plaque. The cells within the plaque starve and enter the developmental program. Aberrant phenotypes can be scored by visual inspection of the plaques. Since the early stages of development are readily reversible, mutants can be selected and then propagated by returning them to nutrients. Strains are preserved in liquid nitrogen and can be recovered by scraping some frozen cells directly onto a lawn of bacteria or into axenic medium. Spores remain viable on silica gel at -20° C for 5-10 years and for longer when lyophilized. The Nomenclature Guidelines describe how to name strains and alleles. Developmental and cell-type gene expression and differentiation have been extensively characterized. The timing and conditions that control the expression of numerous genes are known. Specific regimens of application of extracellular cAMP and differentiation inducing factor (DIF) regulate gene expression in predictable ways. Gene expression has been characterized in a large collection of gene deletion strains under a variety of conditions. This rich repertoire of conditions and extracellular stimuli that control gene induction can now be rationally applied to DNA arrays to gain a comprehensive correlation of gene expression patterns to cellular phenotype. Non-essential genes are easily disrupted by homologous recombination. So far, over 400 genes involved in cell motility, signal transduction, and cell differentiation have been targeted. Strains with multiple gene deletions are constructed by consecutive transformations using different selectable markers. Parasexual genetics and the cre-lox system (Faix et al., 2004) can also be used to construct double and triple-knockout strains. Many of those mutants are available at the Dicty Stock Center. Because the organism displays most of its interesting behavior as either a haploid or a diploid, recessive phenotypes are immediately apparent and are often detectable by clonal morphology. Since the cells are free living, gene deletions that might be lethal in other organisms can often be productively studied in D. discoideum. Restriction Enzyme-Mediated Integration REMI is used to create libraries of strains containing random genomic insertions. Cells are electroporated with a mixture of a linearized plasmid and a restriction enzyme that catalyzes insertion of the plasmid into the genome at corresponding restriction sites. Generally, the transformed cells contain a single copy of the plasmid and the sequences flanking the insertion site can be obtained by rescue in E coli. To verify that the recovered DNA sequence is responsible for the phenotype, the rescued plasmid is used to recreate the genotype by homologous recombination. The frequency of insertion is high enough to also allow suppressor genetics. A large number of new gene products involved in cytokinesis, motility, aggregation, and later development have been isolated. Many REMI mutants in a wild-type background and corresponding genes are available from the Developmental Gene Project at UCSD and the Baylor College of Medicine (you can view availble mutants here). The amoebae are easy to grow, lyse, and process for a multitude of biochemical assays or subcellular fractionations, as decribed in the General Dictyostelium Techniques page. The amoebae grow on bacterial lawns or in liquid cultures of defined media with doubling times of 4 and 12 hours, respectively. Over 1011 clonal D. discoideum amoebae can be grown and harvested in a few days without sophisticated equipment. A small-scale industrial facility could increase this number to 5 x 1012 identical cells (5 kilograms) per week. The cells can be harvested from growth or any of the developmental stages. In the early stages of development, the genetically identical cells differentiate synchronously and the population remains homogeneous. This allows for biochemical analyses to be performed using a variety of physiologically relevant conditions. The high levels of exogenous protein expression obtained in transformed cells makes this system suitable for protein purification. One of the incredible strengths of this model system is the capacity to track the dynamic behaviors of individual cells. For example, the normal cytokinesis displayed by wild-type cells and the aborted cytokinesis displayed by mutant cells can be filmed in suspension. There is a considerable collection of mutants displaying similar defects in cytokinesis in suspension. The optical clarity displayed by the cells facilitates digitized three-dimensional imaging. Studies of the chemotactic movements of wild-type cells have revealed features of normal motility such as the tendency of pseudopods to be initially extended above the substratum and the limited contact that a moving cell maintains with the substrate. Digitized imaging has been used to compare the movements of a wild-type and mutant cells. In the example presented here, it is clear that the mutant moves poorly because it cannot suppress pseudopod formation in the rear end of the cell. The capacity for tracking living cells and phenotypic complementation of null mutants with GFP fusion proteins is providing extremely useful tools for cell biology. One of the significant conclusions of these studies has been the demonstration that cytokinesis, motility, and phagocytosis share features and molecular components. Phenotypic rescue provides assurance that the GFP fusion protein is functional and the behavior of the protein can be followed in living cells under a variety of conditions. Some of the most interesting observations made in these experiments have been the rapid assembly of cytoskeletal proteins in the tips of newly extended pseudopods. For example, coronin, actin, talin, and a variety of other cytoskeletal proteins concentrate in the cortex of nascent pseudopods. Many of these proteins have also been tracked during cytokinesis and phagocytosis and found to translocate to the rims of phagocytic cups and to the distal edges of dividing cells. Signal transduction proteins have also been tracked to discover how cells sense spatial gradients. While actin and actin binding proteins accumulate in the cortex of new pseudopods at the cell's leading edge, surface receptors and G-protein subunits remain uniformly distributed around the cell perimeter. Thus, the key decisions for directional sensing must occur at intermediary steps. One of these steps appears to be a rapid and transient appearance of binding sites for PH domains on the inner face of the membrane elicited by increases in receptor occupancy. In gradients of chemoattractant these sites are persistently present on the side of the cell facing the higher concentration. The local formation of these sites is independent of the actin cytoskeleton and may be an early event in directional sensing. Elegant studies of dynamics of groups of cells are being produced in D. discoideum. Although the multicellular stages are unusual, studies have provided interesting information about the interactions of large groups of cells. The spontaneous aggregation of hundreds of thousands of cells occurs in a highly coordinated manner. The chemotactic movements of the cells are organized by periodic waves of cAMP that propagate through the cell monolayer. The waves are the result of a regulated production and secretion of extracellular cAMP and a spontaneous biological oscillator that initiates the waves at centers of territories. The periodic stimuli are critical for proper timing of developmental gene expression and they control the morphogenetic movements in three-dimensional structures of the multicellular stages. The differentiated cells provide a fantastic system for studies of chemotactic cell sorting. Mixed cells will form chimeric organisms and individual fluorescently labeled cells can be tracked. Prestalk cells sort to the anterior region of the structure while prespore cells sort to the posterior and various mutants sort to specific locations.